Spaying (for females) and neutering (for males) is the surgery done by a veterinarian to prevent animals from reproducing (making puppies, kittens, etc.). This is sometimes called “altering” or “fixing” your pet. Spaying/neutering is an important part of reducing the homeless pet population. If every pet owner spayed or neutered their pets, animal shelters would have far fewer homeless animals in their kennels. spayed— this defeats the whole purpose! It is actually better for a female to not have a litter or a heat period before being spayed. Spaying/neutering WILL NOT make your pet fat and lazy. Too much food and not enough exercise is the main cause of obesity in pets, just as it is in people. Having a male pet neutered WILL NOT take away their “guard dog” instinct. Neutering a dog does not reduce its ability as either a guard dog or a watch dog. He will still be as protective of his territory/family as he was before the surgery. 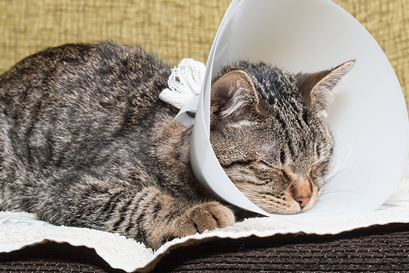 Most pets can be spayed/neutered as early as eight to ten weeks of age. Contact your local veterinarian for more details. Pit Bulls and Pit Bull mixed dogs over the age of 4 months are required to be spayed or neutered. Please see County Code 32.1501 for more information. Dogs older than 4 months must be spayed or neutered if their owner has violated State laws or County Codes regarding animals. Please see County Code 32.1502 for more information. Any resident who lives in the unincorporated areas of San Bernardino County is eligible to participate in the Spay & Neuter Voucher Program. The spay and neuter vouchers have a maximum value of $50.00 for dogs and $25.00 for cats. The pet owner is responsible for any charges that go over and above these amounts. For more information on this program, please contact the Pet OverPopulation Coalition (POPCO) at (888) 767-2550. POPCO volunteers will return your email or voicemail within 2 days. If you qualify, your voucher will be mailed to you. When you receive the voucher(s) you will also receive a list of the local veterinarians in your area that are participating in the San Bernardino County Spay & Neuter Voucher Program. You must take this voucher to one of those veterinarians who will then perform the spay or neuter surgery. View the current list of veterinarians participating in the voucher program. Veterinarians interested in participating in the Spay and Neuter Voucher Program should contact the Animal Care and Control Program Manager at (800) 472-5609. Spay California maintains a County List of spay/neuter resources in each county of California.